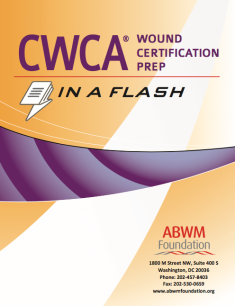 The CWCA® Wound Certification Prep – In a Flash set is to be used for the purpose of self-assessment by those preparing to take the CWCA Board Certification Examination, or otherwise wanting to refresh their medical knowledge and skills. It is intended for educational purposes only to assist you in identifying areas of relative strength and weakness in the content areas that are assessed by the ABWM Board Certification Examinations. Domestic orders will be shipped by Federal Express, and will arrive in 3-5 business days. FedEx do NOT deliver to P.O. Boxes. International orders may be billed additional shipping charges. International orders should arrive in 7-10 business days. Delivery time may vary by country. The CWS® Wound Certification Prep – In a Flash set is to be used for the purpose of self-assessment by those preparing to take the CWS Board Certification Examination, or otherwise wanting to refresh their medical knowledge and skills. 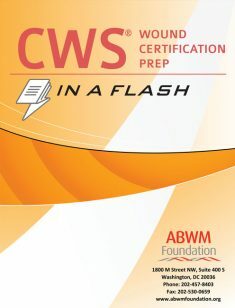 The ABWM Foundation Wound Certification Prep – In A Flash flashcard study systems are to be used for the purpose of self-assessment by those preparing to take the board certification examinations offered by the American Board of Wound Management, or otherwise wanting to refresh their medical knowledge and skills. They are intended for educational purposes only to assist you in identifying areas of relative strength and weakness in the content areas that are assessed by the ABWM Board Certification Examinations. *Please note: Review of this flashcard set is not mandatory, and will not impact your eligibility to sit for the national certification examinations offered by the American Board of Wound Management. The CWCA examination is open to any healthcare or sales and marketing professional with at least 3 years of wound care experience. Candidates with a professional license applying for the CWCA must possess a full and unrestricted professional license in at least one state and in all states in which the candidate currently practices.. For more information, view the American Board of Wound Management’s Certification Eligibility page. *Disclaimer: Persons using this flashcard set to help prepare for an examination offered by the American Board of Wound Management must realize that there is no guarantee stated or implied that review of this document will assure passage of an examination.